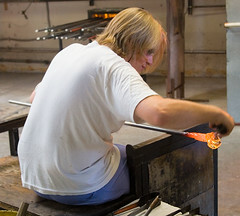 A month ago, Chiara and I took a 1 day glass-blowing workshop1 at Public Glass2. I had a blast! It's something I always wanted to do, and I'm so glad to have finally tried it. I'm also hooked. The malleable, glowing medium is completely fascinating to me. It feels wonderful just play with it. We didn't have time for true play in the workshop, but I can see some of the possibilities already. Sure, there's some danger: burns, improperly cooled glass exploding in your face, burns, severe dehydration if you don't pay attention, burns. But proper technique and awareness go a LONG way toward mitigating the chances of all of those. I knew at lunchtime on that first day that I wanted to take the full class. The next Glassblowing 1 class started at the end of October. With travelling, all the other brouhaha that goes with the holiday season3, and work stress I decided I couldn't really take a class that ran from the end of October until the beginning of December. I resigned myself to waiting until the new year. ...But not very well. I realized that I was very much looking forward to the class, that I could use the creative outlet, and that the class schedule fit my travel schedule perfectly. So I jumped. Yesterday was the first class. It was all pretty much review of the workshop, but we got to practice things several times, and there was a lot less hand-holding. It's a larger class than the instructor expected, so some of the exercises and practice felt a bit rushed, but in general I'm VERY happy that I decided to do it. Next week I blow my first (unassisted, starter) bubble. Hee!!! 1 Chiara found a card for Public Glass at Café Centro a few months ago, and I wanted to jump in and take the class that was starting immediately, but she wisely pointed out that the single day to dabble and see if we enjoy it before committing to a 5 week class was probably prudent, this was the first weekend workshop held since then. 2 If you have any interest in this kind of thing (and are local) I strongly recommend taking the 1-day workshop. The description on the website doesn't do it justice, it's a very condensed version of the 5-week class, so you really get a good hands-on overview of basic glass technique. 3 I only just realized that some of my perpetual trepidation over the holiday stress, and the busyness of the season probably comes from growing up with my mother's business. Mid-November to January 1st is orders of magnitude more crazy than the wedding season ever could hope to be. Huh, whaddya know about that? Envious and awed here too. Way too go. Also a note on footnote 3. Having worked more than one year through that season I can honestly say that it is crazy insane at the kitchen during this time period and I am thankful that I don't work that job now. :) Thanks for the reminder that I am not really all that crazy stressed now. I needed that.